Book early and save. We offer a 10% room rate discount when reserving 60 days in advance. Military and Veterans- we offer a 10% room rate discount. All offers can not be combined. Only one offer or discount per stay. Holidays excluded from all discounts. We are a kid and pet friendly cabin. We go the extra mile to make your stay wonderful. Let us do all the worrying so you can enjoy your stay! Destination----Yosemite National Park ---- Mountain Getaway is just minutes away. You can easily visit Yosemite Valley and Curry Village, the Historic Village of Wawona AKA Big Tree Inn, Mariposa Grove, and in the winter Badger Pass Ski Resort AKA Yosemite Snow Board and Ski area. Mountain Getaway is located just minutes from the Historic Sierra National Scenic Byway. This is a great historical site that offers off-road vehicle trails/roads, mountain biking, hiking, and fishing. Make sure you pack a lunch because you will want to stay and enjoy your day. Mountain Get a Way-- Your retreat for relaxation. You'll love to relax among the tall pines and enjoy the essence of relaxation in our cabin. 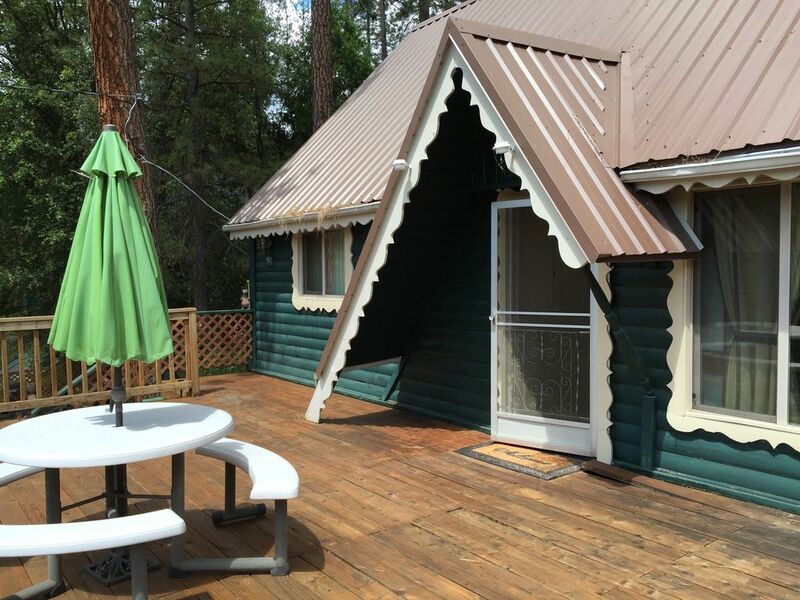 Mountain Get a Way is a 3 bedroom / one bath cabin with an all fenced yard on 1/4 acre nestled in a neighborhood that is safe and friendly for everyone. While staying here you can fall asleep to the relaxing sound of nature. Lewis Creek, which is just down the street and runs year round; is something you can enjoy fishing for German and Rainbow trout as the creek is planted with fish every spring. The fishing is good for both kids and adults. You’ll be sure to catch something. Mountain Get a Way has fruit trees in the back yard and blackberry bushes that when in season, give our guests some sweet treats. Mountain get-a-Way overlooks a forested area of wild flowers, Manzanita, and native trees of oak, pine, cottonwood and cedar. What a wonderful environment to be in while enjoying the passing wildlife amongst the tall pine trees. In the spring daffodils will be blooming all around you on the property. The yard is well kept and groomed. We have many visitors from our local wildlife such as Deer, Gray Squirrels, Raccoons, Blue Birds, and various other birds. You will find Mountain Get A Way is very quiet and relaxing for all. The town of Oakhurst which is just a short drive (10 minutes) to the local grocery stores, public park, and 6 cinema theater. There are many other stores such a CVS, Riteaid, Big 5 and much more. You can also visit the Historical Sugar Pine Railroad and take a train ride through the forest or in the winter enjoy the Snow play area in Fish Camp. Make sure you bring your sled. Love to Fish-- Bass Lake is a man made lake, 7 miles long; just minutes away where you can float out on a raft all day enjoying the nice warmth of the lake water and catch a fish or two. Bass Lake is very warm lake water (About 75-80 degrees in certain spots in the summer). The beauty of Bass Lake is the fools gold in the sand. It's called pyrite. It's tiny little flecks in the sand that reflect off the sun and warm the water. We are certain you will love it! Enjoy a picnic on the beach or take advantage of water sports like jet skiing, canoeing, and water skiing. It's a all day retreat for the entire family. Mountain Get-a-Way is Kid and Pet Friendly with a fenced yard and grass to play on. Peace and relaxation is waiting for you at Mountain Get A Way. Call us for your reservation today. We are here to assist you. Keywords: Spacious Log Cabin home nestled in a quiet neighborhood with tall pine trees and natures beauty all around you. Hi there, We bought this lovely Mountain Get A Way in 2003 and are so excited to be able to share with others across the world. We take pride in providing a nice vacation with other travelers. Our cabin has many nice features such as comfortable furniture and bedding for you to relax on and enjoy your stay. We encourage you to read our reviews as we believe that our guests have made some wonderful vacation memories here. We sincerely hope that you have a wonderful time here at Mountain Get a Way and look forward to your reservation. We chose to buy in the Yosemite area as there are so many things to do around here. If you like to hike, sight see, swim, shop, eat and ski this is a wonderful place to visit. We have all of the above and more. We are also Locals here and know the area very well. We share many unknown areas to hike, swim or just sight see with our guests. You will feel like you are home away from home. We love staying at our Mountain Get A Way for many reasons. One of the fondest reasons is all the things to do around the cabin. Many trails to hike on outside and inside of Yosemite. We Love to Snow Ski so Badger Pass is a highlight for us. Local swimming at Bass Lake in the summer is wonderful and a great way to cool off on those summer days. When the night fall comes going in to town and going to dinner at one of many local attractions for food not to mention were just 20 minutes from the Indian Casino in which you can have a great time and good food for those your desire a little night life. 1 full bath with tub and shower. What a beautiful scene to look at with pine trees and natural wildlife like deer roaming around at a distance. We provide all bed sheets, blankets and pillows ~Free of charge~ to our Guests. U shape driveway. plenty of parking at cabin. Kitchen hand towels are provided. Guests are asked to bring their own BATH towels. Pellet stove and all pellets are provided. plenty of seating for 8.
and all the pots and pans you need to prepare your favorite dish. all the cook ware needed to prepare your favorite dish or bake. everything you need for your vacation and More..... Just bring your food. Some board games and cards in cabinet in hall stair way. upon request we have lots of DVD's for your stay. Just ask and we will be happy to provide. Picnic table and umbrella to sit on as well as BBQ and park bench. This lovely cabin is just what you and your family/friends need to enjoy your time in the Mountains. It will take your breath away while relaxing in the Sierra Mountain. Nicely located near Yosemite but far enough to get away from the hustle of the park. House was a little dusty with quite a few dust webs. Must have not been rented in awhile but seemed clean underneath. Owner were helpful answering questions. Wonderful cabin with great proximity to Yosemite and Oakhurst. Reservation and all emailed communication was a breeze and the cabin was in perfect order when we arrived. Very comfortable beds and living space, and also a well-outfitted kitchen (although we ate most meals out). Only suggestion is addition of floor fans in the upstairs bedrooms -- in June they were somewhat hot at night even with the windows open. A great find for our Yosemite vacation! The cabin itself was nice; especially the layout. There is one bedroom on the bottom floor and two bedrooms upstairs. The check in process was easy if you follow their directions. There is no service in the area so have the email printed out or saved on your phone. It was about 45 minutes to Yosemite Village which was nice to be outside of the park. All necessities nearby such as gas, grocery store and restaurants. The cons of the cabin were that it did not have basic cooking essentials such as salt, pepper and oil. The other con was the booking process. I was called the incorrect name multiple times, charged two incorrect fees which I had to point out. This is our second time staying at this home. It’s only a few minutes from downtown Oakhurst, and about 20 minutes from the entrance to Yosemite. The area is very quiet this is our second time staying at this home. It’s only a few minutes from downtown Oakhurst, and about 20 minutes from the entrance to Yosemite. The home is comfortable and allows dogs, with a completely fenced in backyard. The interior is cute and clean, and we love the ambiance. The kitchen is stocked with some items, but there are no measuring cups or measuring spoons, so bring your own if you are cooking dinner. Thank you Kristi for your review. We are glad you had a wonderful time. Your a excellent guest and appreciate your repeat business. We take pride in our cabins and appreciate your sharing that there were no measuring cups. We have replace them so that the next time you come, they will be there for you. Of course, anytime there is not something that a guest needs that is a regular item, we try our best to get it for them so that their stay is as perfect as it can be. We want all your vacation memories to be positive! House was very comfortable,we used the pellet stove at night for little while and house warmed up nicely.Kitchen was well stocked,easy to cook. Bed was very comfortable. Thank you Ken for your excellent review. We are glad you had a great time and enjoyed the cabin. We appreciate your sharing your experience as it tells the story to future guests. Security deposits are refunded if no damage within 3-7 days after your stay.